WE OFFER 50/30/20 SERVICE!! WIFI AND CABLE TELEVISION IS INCLUDED IN THE RATE!! 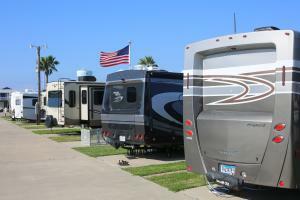 PLEASE GIVE US A CALL AT 361-749-2208 IF YOU WOULD LIKE TO RESERVE A SITE. SURFSIDE IS A SMALL INDIVIDUALLY OWNED BUSINESS!THANK YOU FOR YOUR PATRONAGE AND SUPPORT IN HELPING PORT ARANSAS RECOVER FROM HURRICANE HARVEY!! OFFICE HOURS: 9-5 MONDAY - SAT. We make arrangements for after hour arrivals!! 2 blocks to the beach via sidewalk or road....not directly on the beach = less sand in your RV...yet just close enough!! Seabreeze helps keep those mosquitoes away!! Short term rentals only (6 months or less.) You will not see permanent fences and decks surrounding RVs!! RV sites are nice and tidy!! 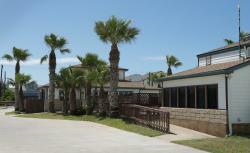 Well maintained grounds, pool area, and clean restrooms!! 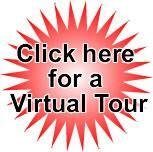 CHECK OUT OUR CONDO LISTINGS AS WELL! Please call 361-749-2208 to make your reservations. 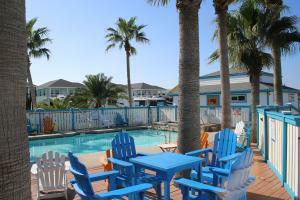 Port Aransas is a quaint fishing village on the Gulf of Mexico. 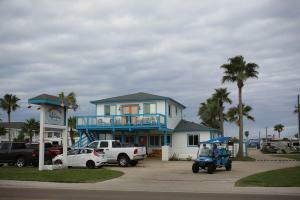 It is situated on the northern tip of a barrier island, lying 18 miles offshore from Corpus Christi at Mustang Island. This 18-mile stretch of clean, sandy beach offers visitors birding, shelling, fishing, beach combing, surf fishing, or just plain relaxation. 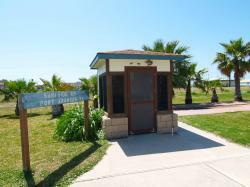 Click Image to Enlarge Close to shopping and restaurants and within 2 blocks of the Texas Gulf Beach is the Surfside RV & Resort. Relax with full hook-up sites with concrete pads and cable TV. Enjoy the swimming pool during the day and also evening hours. Coin Laundry, full size bath house, wide concrete streets,and a recreation hall. The city provides a motorized trolley seven days a week from 10:00 AM until 6:00 PM. Ring the bell to get off and wave the driver anywhere to get on. This is a great way to explore the sites of our area. We are also a golf cart friendly park. Click image to enlarge We have a noce pool area with a deck for reading. etc. We do not provide picnic tables on site. If you will need a table, please bring a foldable table, we recommend foldable Lifetime tables. As you come off the ferry, turn right at the stop light, there is a convenience store (Stripes)on the right. Follow Cut-Off Rd. through the light at the intersection of Ave G and Alister. Then, take a right onto 11th street. We are a several blocks down on your right, at 1820 South 11th Street..
Take Hwy. 361 to the first stop light, turn right at the convenience store (Stripes) onto Beach Access Road 1A. Then, take your first left onto 11th street. We are several blocks down on your left, at 1820 South 11th Street.